This update adds Partisans, a different type of rebellion now specific to “resistance” from invaded cities. Partisans uprisings can happen regardless of the loyalty level of the city, as long as there is resistance. Each uprising however lowers the level of resistance. This update also adds limited ammo for ranged units in battle, and increases the cover provided by defensive walls and battlements. This should fix the problem of range units being the best offensive unit as they could wipe out entire defenses not matter the fortifications, provided they had the highest range. Now, range units will deal much less damage, and once their ammo is depleted they will retreat and leave the battle. Lastly, Nations now provide automatic right of passage, trading agreement, and defensive pact: if a member is attacked, all other members will automatically declare war as well, with the breaking closes being on the side of the initial aggressor. This will help national armies to become relevant as they’ll be immediately usable in case of attack, unlike before where each nation member would have to declare war manually once online, so that his national armies could be used. – reduced home distance malus of AP recovery from 5 to 3% per tile. – changing home of a formation now depletes all its AP and auto-encamps it. – added a different event for rebellions caused by resistance: partisans uprisings. They can happen independtly of the region’s loyalty and tend to be better equiped than rebels. – partisan uprising events lower the level of resistance in the city proportionnally to the strength of the uprising. – fixed an error causing battles to be invisible in the region view (and potentially other battle related bugs). – added ‘ammo’ to units in battle -> attacking range units with depleted ammo will retreat from the battle, defensive units will idle. – defending armies in cities get a x5 ammo boost. – increased cover from palissades and defensive battlements. – cover (when >0) is now displayed next to troop banner flags, when deploying them and during battles. – fixed palissades not providing cover for the tile on the other side of the wall. – It’s no longer possible to abandon buildings in resistant cities. – It’s no longer possible to respawn on a character/city you were the last player to control. This update adds Action Points for armies: from now on, moving and performing actions such as attacks costs Action Points. Action Points recovery is slow, but a new action has been added: “encamp”, that increases the recovery speed greatly but locks the Army until it has at least 50 AP. Being in a friendly city, or even better in its home, also provides a significant bonus while being far away reduces it. 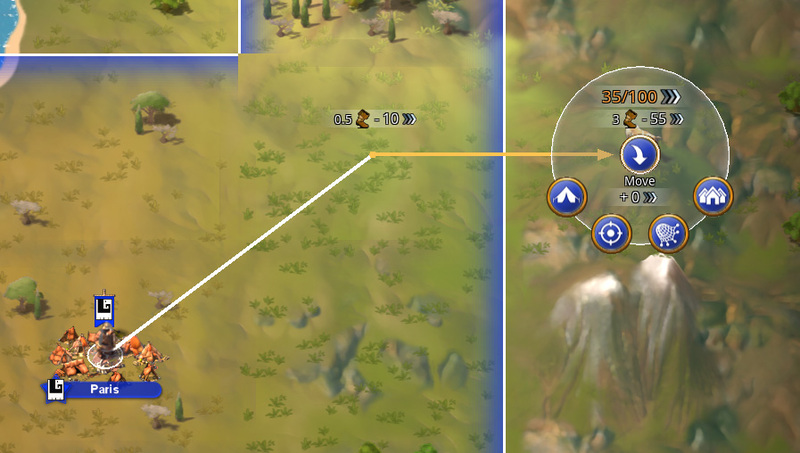 The terrain is also now much more strategic, as tiles cost different amounts of “Movement Points” ( boot icon ): mountains, hills, or rivers, are now really costly to move across. Territorial claims now play a more important role as enemy terrain doubles movements while friendly territories reduce it (any territory with right of passage). Also, cities have a fixed movement cost regardless of the terrain, allowing to create strategic mountain passes. Each army has its own AP movement cost, depending on its content. Armies made fully of mounted units get a significant bonus while army size increases the cost proportionally: a small “scouting” formation of 10 horsepigs will be among the fastest moving formations while a large army of infantry will be very slow. If your formation has a movement cost of 10AP and you move across a terrain costing 3 Movement Points, then it will cost 30AP to complete the movement. – It increases the feeling of distance and world size, making it much harder to go far away. – It makes war more tactical with movements and terrain playing a more important role. 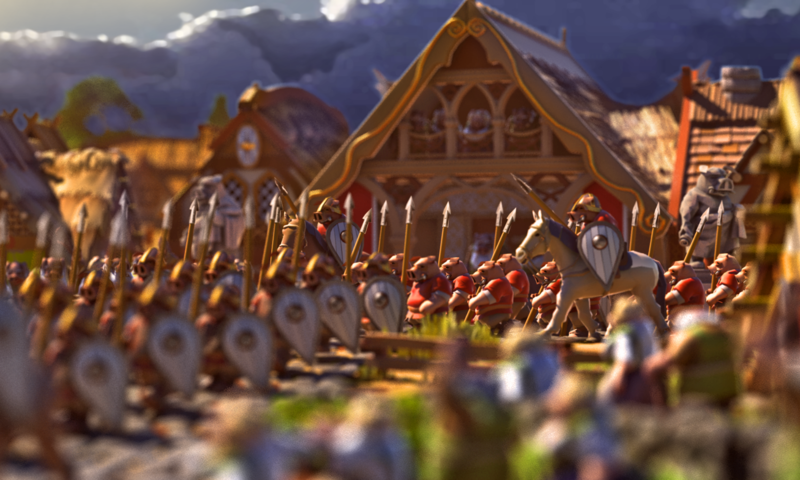 – It prevents exploits and unfair-play behaviors such as an attacker waiting 4am to move his huge army across the world, spam Raid all of a player’s cities 8 times in a row to raze them, and move back to the safety of his castles all in an hour and before the defender even realizes it. – As attacks will deplete the AP of armies, they will be effectively “locked” encamping in the neighboring territories after the battle, giving a chance to the defender to organize a counter-attack. – This system allows to limit and slow down movements of large armies during wars without penalizing too much day-to-day movements between your own cities close to each other, such as transferring resources with carriers. A new movement UI also allows you to see the available actions and preview the AP costs of movements. This update also includes a re-balancing of Resistance and Loyalty mechanics to counter multiple new exploits recently used by hostile griefers (yes, they’re already here!). Resistance is now much higher and proportional to the city’s population, while authority given by armies is now based on both numbers and “military power”. The “military power” of civilian units is also greatly reduced, so that civilian armies can no longer be used to provide easy loyalty bonuses. Resistance is no longer a unique value, but multiple, saving resistance vs each player so that exploiters can no longer game the system to “clear” it artificially by transferring the invaded cities among them. A new movement UI now allows you to select available Actions directly, and also previews AP movement costs. Action Points are now required to move formations and perform actions like attacking. Depending on the army’s constitution, each Movement Point costs a variable amount of Action Points. – added Action Points for formations, required to perform actions such as movements or attacks. – added Encamp action, locking the unit until 50% of AP are restaured but increasing the AP recovery speed. – new movement UI, with movement cost previews and a new ‘buttons wheel’ listing available actions shortcuts. – formations will auto encamp when they can’t complete a movement or action. – enemy territories cost double mouvement. – friendly or owned territories cost reduced movement. Cities cost 0.5 movement no matter the terrain. – moving close to a formation’s home cost reduced movement. – Armies and National armies now cost 5 state power each to maintain. – fixed exploits allowing to cancel resistance level in a newly invaded city. – changed resistance calculation when a region is changing ownership: now takes in consideration both loyalty to previous owner but also cultural influence of the new one + now proportionnal to the city’s population. resistance in large cities is now likely to be much higher. – changed calculation of loyalty bonus/malus from armies and militias: now takes both military power & numbers in consideration. weight of it is globally decreased. – fixed bug with merchants having an invalid supply. – fixed bug with range covers not working. – fixed national armies not providing authority to other players of the same nation. – reduced “power” stat of civilian units. – fixed exploit used to avoid exploration events: its no longer possible to disband/recruit in formations that are immobilized (by events). – fixed bug where defensive troops’s autodelpoy would deploy them directly on top of incoming enemies. – fixed multiple display issues with lower resolutions. – fixed comments displayed out of screen for UI elements at the bottom of the screen. – a formation whose path is blocked by an hostile unit will auto-cancel its mission and movement (unless that world tile is its target). – defeated units in battle no longer attempt to retreat to their home.